First steps toward getting action on the rehabilitation of the Japanese area being evacuated here was being planned today by the Board of Supervisors. After a lengthy hearing attended by Federal and local officials and representatives of American and Japanese-American property owners, the boards committee on public buildings, lands, and city planning yesterday forwarded to the parent body a resolution requesting the Home Owners Loan Corp. to take over the problem. The motion was made by Supervisor MacPhee, and was indorsed by Supervisors Uhl and Gallagher. Subject to approval by the board Monday, it memorializes the HOLC to investigate the possibility of providing property owners with funds at low rates of interest for the rehabilitation of their homes. Two other ideas were advanced. Milton Morris, representing the Associated Home Builders, asked for foresight and post war planning, and advanced a four-point program. Establish a local land commission with powers of executing titles, establish a Federal urban land commission to make grants for paying owners whose substandard dwellings would be demolished, sell the land to private developers, and create a new home district for the citys residents to purchase. Albert Evers, executive of the San Francisco Housing Authority, suggested the possibility of SFHA acquisition of blocks where there are majorities of substandard dwellings and the rehabilitation of those districts for defense workers. In doing this, he said, acceptable quarters could be provided for many of the 8000 men who will be employed at the Bechtel shipbuilding plant being erected in Sausalito. Dudley Dacre Stone of the City Planning Commission touched on this same idea, and Supervisor MacPhee said Bechtel officials informed him they were interested in the idea. 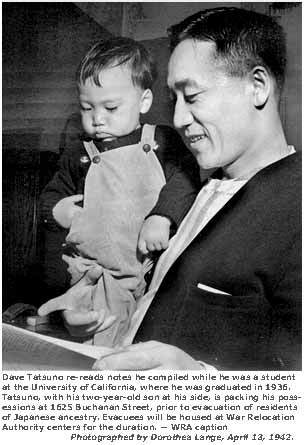 Little Tokio is 23 minutes by bus from the Sausalito yards, Mr. MacPhee said. Speaking for the Japanese-American Citizens League, Dave Tatsuno of 1625 Buchanan-st, a native of San Francisco and a property owner, said he hoped the district could be kept for the Japanese now evacuating it. When better days come for this nation and we are able to return, we should like to come back to the same district, Mr. Tatsuno said. Raymond Smith, San Francisco Real Estate Board secretary, and several others urged slum clearance programs of various kinds.